Tamil Nadu jumped into top spot by completing a convincing victory over Punjab in Amritsar. Punjab were in deep trouble at the start of play, needing to bat most of the day with only five wickets remaining to save the match. There was to be no escape for Punjab, with three wickets falling in the space of 16 deliveries - including those of Pankaj Dharmani and Gaurav Gambhir - in the morning. Their final pair of batsmen fought on for nearly 20 overs before Sarabjit Ladda became R Ashwin's fifth victim of the innings. All five wickets that went down on the final day were to the offspinning pair of Ashwin and Suresh Kumar, who struck twice. Mumbai completed a dramatic come-from-behind victory over Himachal Pradesh to move to joint-second in their group. Himachal Pradesh started the day needing 248 runs to win, with all their wickets in hand, but fell short by 85. None of their specialist batsmen were particularly aggressive, but after 41 overs in the day, they had made progressed to 78 for 3. Medium-pacer Harmeet Singh then put Mumbai on course to victory by sparking a middle-order collapse; he took three of the four to fall for the addition of nine runs and Himachal were down to 87 for 7. Sarandeep Singh and Abhinav Bali resisted with 30s, but Iqbal Abdulla got both of them to hand Mumbai their first win of the season. As expected, it was a tame draw at Bhubaneswar in the bottom-of-the-table clash between Orissa and Railways. There was little likelihood of any other result after rain barely allowed play on the previous two days. On Friday, when a full day's play was possible, there was little exciting cricket. In the morning, Railways added 10 runs before losing their final two wickets, with Krishnakant Upadhyay left stranded on 49. Orissa's batsmen then crawled to 132 in 79 overs; highlighted by Pravanjan Mullick's innings - though he hit a four and a six, he needed 76 balls to compile 14 runs. Both teams got a point each for their efforts. In another rain-affected match, Rujul Bhatt's maiden century - which he nearly converted into a double - powered Gujarat to a massive 300-run lead before they were bowled out by Hyderabad just before stumps. Hyderabad were looking forward to some batting practice after they nipped out three quick wickets to reduce Gujarat to 305 for 7. Bhatt, though, found a solid partner in Ashraf Makda, with whom he added 128 for the eighth wicket. Even after Makda's dismissal, there was to be more toil in the field for Hyderabad; Bhatt scored almost all the runs as Gujarat piled on 103 runs for the last two wickets - his partners only contributing only nine runs between them. Karnataka increased their lead at the top to four points after taking the first-innings honours in a draw against Bengal in Mysore. Karnataka declared on their overnight 523 for 9, an advantage of 199 runs, leaving Bengal an entire day to bat out to save the game. Two of their senior batsmen, Deep Dasgupta and Manoj Tiwary, responded to the challenge, making half-centuries to deny Karnataka any chance of an outright win. The biggest partnership Bengal put together was of 64 runs, between the openers, but they rarely lost two wickets in quick succession. With 27 overs to go Bengal had lost half their side, but Tiwary remained unbeaten to calm his side's nerves and shepherd them to safety. A solo effort from Kedar Jadhav, who made nearly 70% of Maharashtra's second innings runs, helped force a draw against Saurashtra in Rajkot. Saurashtra polished off the final three wickets of Maharashtra's first innings in less than 15 overs to gain a big lead of 255. The wickets continued to tumble in the second innings, Maharashtra were 8 for 2 after four overs and Saurashtra were eying a victory. That second wicket brought in Jadhav, who defied Saurashtra with 18 fours and a six on his way to an unbeaten 111 - the next highest score was 17. Maharashtra lost only three wickets in the final 65 overs, which meant Saurashtra had to be content with three points. After the battle or first-innings points had been thrillingly settled on the third day, it was a dull finale to the game between Baroda and Uttar Pradesh at Ghaziabad. Opener Connor Williams missed out on what would have been his 18th first-class century by four runs, but his efforts took Baroda to the safety of 250 for 6 after 55 overs on the final day. With an outright win out of the question, Yusuf Pathan blasted a 79-ball 78 to muscle Baroda past 300. 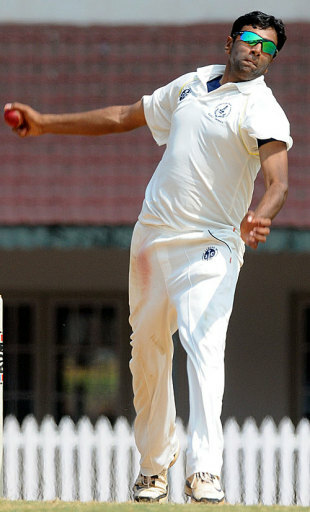 Left-arm-spinner Praveen Gupta was the most successful of the UP bowlers, taking four wickets.